Africason | African School | Africa son | History | Black Consciousness | Education: Why The West Killed Patrice Lumumba. Patrice Lumumba battling for his life in the hands of western engineered mobs. Later this year, the Belgian Parliament is due to report on the murder of the Congo’s first prime minister after independence, Patrice Lumumba, in January 1961. The circumstances of Lumumba’s death have been shrouded in mystery for 40 years, but as the Congo’s vast mineral wealth is once again becoming a focus for imperialist rivalries, documents long hidden in official archives have been brought to light. Last year, the BBC ran two documentaries on the tragic history of this central African state. “Who Killed Lumumba?” was screened as part of the channel’s Correspondent series. It drew heavily on the forthcoming new book by Belgian historian Ludo de Witte (“The Murder of Lumumba”, Verso Books, ISBN: 1859846181, published June 2001). De Witte has put together the facts of the case from official Belgian archives and the documentary also used archive film footage and interviewed surviving witnesses, to show that Lumumba was murdered in a plot masterminded by Western governments. Mobutu, from the BBC’s “Storyville” documentary series, reveals how the Western powers put Joseph Sese Seko Mobutu in power after the death of Lumumba, keeping him there for 32 years while he systematically looted the country. Mobutu became the West’s main Cold War ally in Africa, and the Congo formed the staging post for CIA operations against Soviet-backed African regimes. The film reveals the very close personal and political relationship that existed between Mobutu and several Western leaders. We see film clips of Mobutu being embraced by Jacques Chirac (then President of France), and sitting next to the British Queen in the royal carriage. For many years, until he fell out of favour at the end of the Cold War, Mobutu remained a friend of the Belgian king, but his closest friends were President George Bush (Snr) and his family. Between 1885 and 1908, some five to eight million people fell victim to King Leopold of Belgium’s personal rule over the Congo, under a barbarous system of forced labour and systematic terror. In 1959, the Belgian government finally decided to grant the Congo independence. The first elections brought Patrice Lumumba to power as Prime Minister. But his government was an unstable coalition of regional interests, and collapsed within a week. Sections of the army mutinied and the mineral-rich province of Katanga seceded. 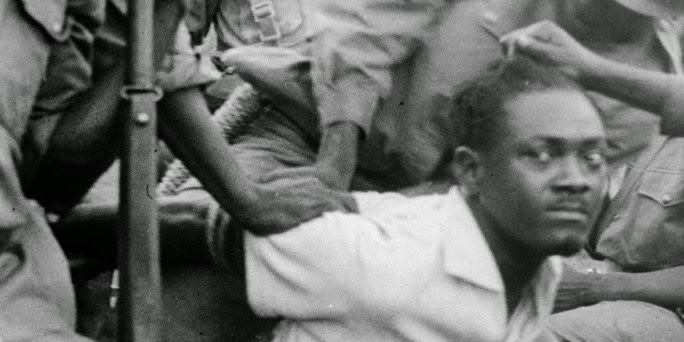 “Who Killed Lumumba?” featured important new material about the Katanga secession. Ludo de Witte has uncovered documents in the Belgian archives showing that Moise Tshombe, who led the secession, acted on orders from the Belgian government, which has always claimed that it only sent troops into Katanga to protect Belgian lives and property. De Witte’s research has shown that the Belgians plotted to dismember the Congo. US Documents released last August reveal that President Eisenhower directly ordered the CIA to assassinate Lumumba. Minutes of an August 1960 National Security Council meeting confirm that Eisenhower told CIA chief Allen Dulles to “eliminate” Lumumba. The official note-taker, Robert H Johnson, had told the Senate Intelligence Committee this in 1975, but no documentary evidence was previously available to back up his statement. Larry Devlin, the CIA’s man in the Congo at the time, told the BBC filmmakers how he had been told to meet “Joe from Paris”, who turned out to be the CIA’s chief technical officer, Dr Sidney Gottlieb. Eisenhower was not alone in coming to the conclusion that Lumumba must die. A British Foreign Office document from September 1960 notes the opinion of a top-ranking official, who later became the head of MI5, that, “I see only two possible solutions to the (Lumumba) problem. What steps, if any, were taken to put this plan into action remain unknown. De Witte’s work reveals the steps that the Belgian government took to remove Lumumba. Belgian military chiefs made nightly visits to Mobutu, then head of the army, and President Kasavubu, to plot Lumumba’s downfall. Colonel Louis Maliere spoke of the millions of francs he brought over for this purpose. The plot to kill Lumumba was called “Operation Barracuda” and was run by the Belgian Minister for African Affairs, Count d’Aspremont. The Belgium government ordered Kasavubu to sack Lumumba, who turned to the new Parliament and won two votes of confidence. Mobutu then led a coup d’état and Lumumba was placed under house arrest, from which he escaped only to be captured by troops loyal to Mobutu. Contemporary film shows UN troops standing by while Lumumba is first beaten in front of Mobutu, then paraded through the streets of Leopoldville (now Kinshasa) and finally beaten again. Both these films do a valuable job in bringing to the attention of a wider audience the new evidence about Lumumba’s death and in revealing the way in which the imperialist powers supported Mobutu’s dictatorial regime. However, what neither of them fully explains is why the West acted as it did. They present the assassination of Lumumba and the installation of Mobutu as simply part of the Cold War rivalry between the West and Moscow. The central mystery of Lumumba’s death remains. Why was he killed? Why was the might of at least three Western powers bent on eliminating this one man – even as he was held prisoner, reviled and beaten by his captors and was without military or political power? Some say the answer is that he posed a threat to the West because he was a committed Pan-Africanist, and since his death he has certainly taken on the status of a Pan-African martyr. By late 1959, Britain and America had concluded that, far from representing a threat, Pan-Africanism offered the best chance for preventing revolution in Africa. Pan-Africanists of much longer standing than Lumumba, such as Nkrumah, Kenyatta, Nyerere, Obote and Azikiwe had also come to power around this time. The experience of the Congo, with its million-strong working class – the largest on the continent outside South Africa, was a powerful factor in bringing them to that conclusion. When strikes and demonstrations broke out in 1959, as the mineral boom ended, the Belgian government decided to grant its colony independence. Their repressive apparatus was geared up to brutalising a divided and dispersed rural population, not an increasingly well-organised working class that was losing its local and communal loyalties. When Lumumba showed that he could not be relied upon to control the Congolese working class, his fate was sealed. The West decided to make an example of him to the masses and to other African leaders, to show what would happen if they opposed imperialist dictates. Mobutu, who had impressed the CIA on his brief visits to Brussels as Lumumba’s secretary, was chosen as the better candidate to safeguard Western interests. Through a mixture of brutality and political guile, Mobutu succeeded in ensuring that the Congo (renamed Zaire) did not become the flashpoint for an African socialist revolution.